Updated in November 2011--these are still a staple in our house each fall. I make a batch and we literally devour it within a few days...these little gems are just irresistible! Yes, they're full of sugar. And shortening. And chocolate chips. But pumpkin is a vegetable, so it all evens out right? That's what I tell myself after I eat 10 in a night! 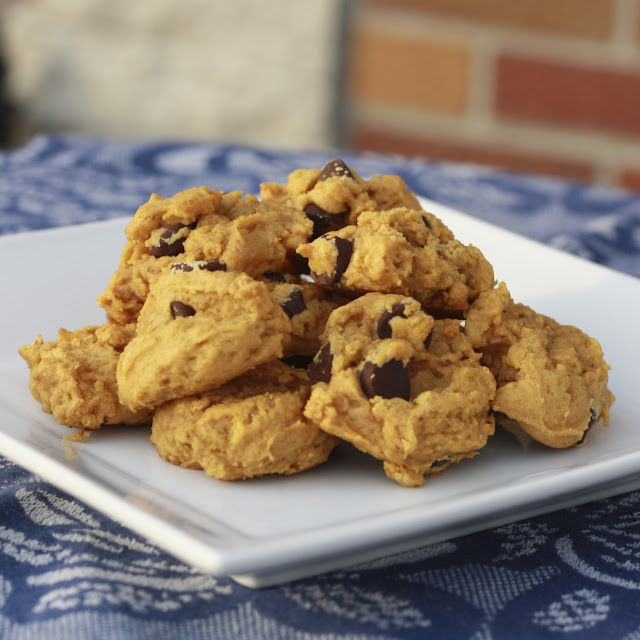 :) Try them, I dare you to find a better pumpkin cookie! 2. Mix sugar, pumpkin, and shortening in a large bowl until combined. 3. Mix dry ingredients in a separate bowl and add to the pumpkin mixture, blending well. 4. Drop large tablespoons of batter onto ungreased cookie sheets. Bake for 8-10 minutes. **my friend always stored these in a container with a slice of bread to keep the cookies soft, but I never have and they've stayed soft...probably because we eat the entire batch before they have a chance to get hard! **I usually make my cookies pretty small because they fall apart if they get too big but know that this recipe makes a LOT of cookies (I got 100 this time! ), so just share with your friends...they'll be thrilled! This was one of those dinners where I literally threw whatever I could find in the fridge into this dish in the hopes that it would all taste okay together. In this case, it did! I'd never made stuffed peppers before, but green peppers were on sale 4/$0.75, and I needed to use some of mine up before they went bad. Typically stuffed peppers have ground beef or turkey in them, but I didn't have either on hand. I did have a few cans of beans that I could've used in the filling, but I was saving those for other recipes. So, instead I went with a veggie-based filling, and figured we'd get our protein from eating copious amounts of candy corn + peanuts later that night (the protein coming from the peanuts and not the candy corn, obviously). 1. Preheat oven to 375. Cut the tops off of the green peppers and clean out the seeds and membrane. Set aside. 2. In a food processor, chop the spinach, celery, carrots, and tomatoes (could also chop by hand, it'll just take longer). 3. Microwave the brown rice and pour into a bowl. 4. Add the veggie mixture to the rice and stir to combine. 5. Add the ricotta and the tomato sauce and mix well. Sprinkle liberally with garlic powder and parsley and stir again. For being a complete dinner on a whim, these turned out really well. They smelled great while cooking and were very flavorful. I was a little disappointed that the ricotta cheese couldn't really be tasted, but it did make the filling nice and creamy. **Note: there was a lot of extra filling! we easily could have stuffed 2 more peppers. When trying to determine what I all wanted to serve for game night, I found this yummy-sounding recipe. I liked that it could be made ahead of time and it was easy to make. These were a hit! I only tried one, but I had a few licks of the filling when I was putting it together. These were great dipped in salsa and could easily be altered with different fillings! 1. Combine all ingredients but the salsa and tortillas in a mixing bowl and blend well. 2. Using a knife, spread a layer of the mixture on a tortilla. 3. Roll the tortilla up and place it in a container. 4. Continue until you run out of tortillas or filling (I filled 10 and still had some filling left over). 5. Refrigerate overnight and slice the next day. Yum! Perfect little appetizer bites! Thanks for sharing your recipe Abby! This post has been updated--see better pictures HERE! This dip is very sweet and so addicting! I suppose you could leave out the chopped peanuts if you have an allergy or something, but if not...Don't! They make it! 1. Mix all ingredients in a large bowl until well combined. 2. Keep cool in refrigerator until serving. 3. Serve with sliced apples. I made these on a whim for game night because they were relatively easy to make and I like all things marshmallow (I'd seen them on the blog Dinner and Dessert). When I made them Thursday night, I didn't think they seemed like anything special. Then on Friday when I was cutting them and sneaking a few tastes, I thought they were pretty decent...good but not my favorite. However, they went over VERY well with my friends...several people commented on how much they liked them and a few guys even took the leftovers with them, saying they planned to eat them all on their drive home. So, I guess they were indeed quite good, I just wasn't feeling them that night! 2. Add eggs and vanilla, beat until fluffy. 3. Combine the dry ingredients (flour through salt) in a separate bowl and add to the creamed mixture. 4. Pour into a greased 9 x 13 pan. 6. Remove the pan from the oven and sprinkle the marshmallows over the cake. Return to the oven for 2-3 minutes. 7. Again, remove the pan from the oven and use a wet knife to spread the marshmallows evenly over the cake. Cool. 8. Melt peanut butter, butter, and chocolate over low heat in a small saucepan, stirring constantly, until combined and fully melted. 9. Stir in the rice krispies until they are fully coated in the chocolate mixture. 10. Immediately spread over bars. Chill bars until ready to serve. **Sorry, I meant to take step by step pictures of this recipe, but completely forgot! A few weeks ago we had a work picnic that was potluck-style. If you'll recall, I made these. There was a great variety of dishes there, including some chinese desserts that I loved! This spinach dip was one of the "classics", and I definitely had more than my fair share of servings. I love spinach in all forms, but put it in a dip like this or spinach artichoke dip, and I'm extra happy! However, I've never actually made spinach dip before, so I asked my co-worker for her recipe and she told me she just used the one on the Knorr Vegetable Soup mix box. I went to the grocery store that afternoon to grab the ingredients and added this to the list of things I was making for game night! 1. Squeeze spinach until dry. 2. Mix together spinach, sour cream, mayo, and soup mix. 3. Stir in water chestnuts and green onions. 4. Cover and refrigerate for at least 2 hours (I kept mine in there overnight). 5. Hollow out the loaf of bread and fill with spinach dip. 6. Cut the bread filling into cubes and use as dippers. **You could also use crackers or vegetables as dippers! My mom is famous for this recipe. I don't think she can take it anywhere without someone asking her to share the recipe. This is a staple at any family party or social gathering that my mom hosts, and she's constantly being asked to bring it to share. In fact, her personal trainer loves it so much she always makes him a big batch at Christmas. Now this is not exactly healthy, so you know it's good when the personal trainer can't get enough of it! This praline mix is not difficult to make and one batch yields a ton (but believe me, you'll want it all!). This is perfect for a party or to store in your cabinet to snack on. Enjoy! 2. In a medium-sized saucepan, heat the butter, brown sugar, corn syrup, and salt until it boils, stirring constantly. Boil for 4 minutes, stirring from time to time (the mixture will bubble and froth). 3. Remove from heat and stir in baking soda and vanilla. 4. Pour the mixture over the cereal mix and stir until well coated. 5. Lay the cereal mixture in a large roasting pan or on cookie sheets and bake in the oven at 250 degrees for 1 hour, stirring every 20 minutes. 6. Remove from oven and spread mixture on wax paper until cool. Store in containers with lids or ziploc bags until ready to eat! Beware of its addicting powers! Friday night we had some friends over for a game night and I made several different snacks for people to munch on throughout the night. I'll be posting these recipes over the next few days, or as soon as I can get them up. Stay tuned, I'll get them up soon :) That's all I have for the weekend, we've spent the rest of the weekend eating leftovers and getting food from other places (yummy Thai food at a new-to-me thai place last night, AWESOME bread from a local bakery at the 5k we volunteered at this morning)...it's been a nice break from cooking, but I'll be back in the kitchen soon! When I was asked to bring a breakfast item to our church women's event this Saturday, I immediately starting thinking about all of the quick breads, muffins, and coffee cakes that I have bookmarked in my google reader to make. Then, I remembered that I had pulled a breakfast cookie recipe out of a Better Homes and Garden magazine awhile ago. Cookies for breakfast? Who wouldn't like that?! 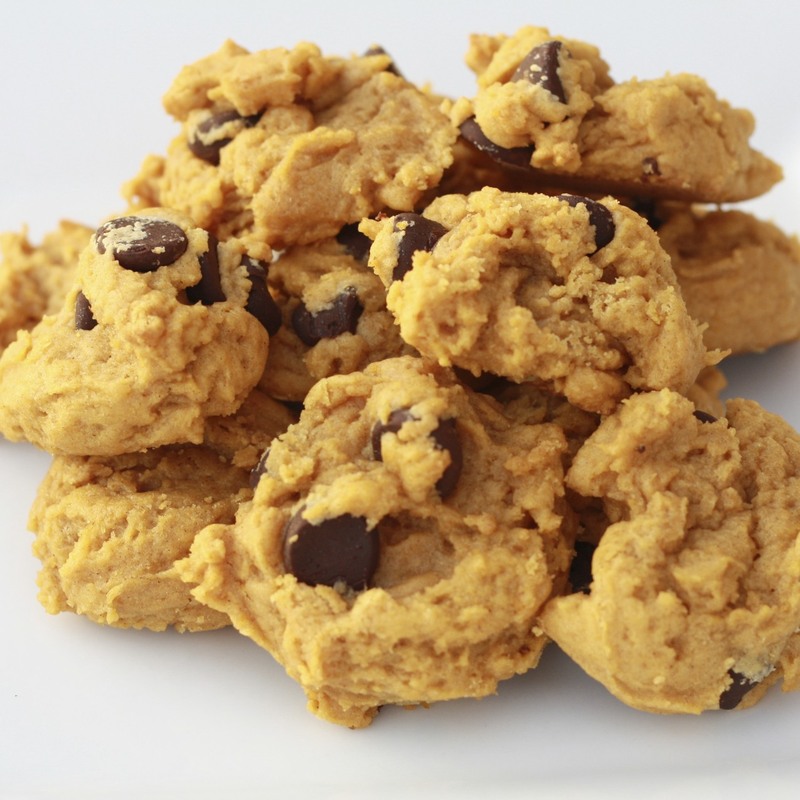 These cookies are great for breakfast or anytime! They aren't super sweet and taste pretty healthy, thanks to the whole wheat flour and minimal amount of sugar. These were easy to make although the dough was very sticky to work with, even after chilling for about 45 minutes. There were plenty of these cookies left over and the girls were happy to take them off my hands, so I'd say they were a hit! 2. Beat butter and peanut butter in a large mixing bowl on medium to high speed for 30 seconds. 3. Add sugar, baking soda, and salt. Beat until combined, scraping the sides of the bowl. 4. Beat in water, egg, and vanilla until combined. 5. Beat in flour until combined. 6. Beat in oats until combined. Stir in raisins/chocolate and cereal. 7. Drop dough by scant 1/4 cupfuls about 3 inches apart onto an ungreased cookie sheet. Flatten slightly. Bake for 10-15 minutes or until edges are lightly brown. 8. Cool on a cookie sheet for 5 minutes; transfer to a wire rack to cool completely. Store cookies in a tightly covered container for up to 5 days or in the freezer for up to three months. I still have a pretty full box of Bran Flakes left and I wanted to do something different than muffins this time. After some online searching, I found several recipes for Apricot Bran bread. I was intrigued by this recipe, as it has you mix all of the ingredients but the flour and then let it sit out overnight (it didn't say anything about refrigerating, but Ryan was not a fan of leaving it out on the counter, so I put it in the fridge overnight...I didn't want to be forced to eat the 2 loaves by myself!). Furthermore, this bread recipe has no eggs or oil, which is pretty atypical for a quick bread (aka super low fat). Intrigued, I opted to give it a go and boldly doubled the recipe (trying to get rid of milk before it goes bad!). Two nights ago, I mixed the bread up and then I actually finished the bread off the next morning before heading into work. I guess there are some benefits to being up at 5 am every day! This bread turned out wonderfully and I'm pretty happy we now have an extra loaf waiting for us in the freezer! It's a very short, dense bread with sort of a gummy texture which might turn a lot of people off. However, we really liked the texture and flavor. On our way out the door to work, we both tried a bite of it warm and liked it...but both liked it better that night after it sat in the fridge all day. This is definitely different than the usual quick bread, but it was a nice change and I know the first loaf won't last long! 1. Put the bran flakes, milk, sugar, apricots, and honey in a bowl. Cover and let it sit out overnight. 2. The next day, add the flour and mix well. 3. Pour into 2 greased loaf pans. I love frozen desserts (actually, if you haven't realized it yet...I'm a fan of ALL desserts!) and have seen several different versions of frozen peanut butter pie. I'd saved a few different recipes and combined them to create the version below. I used low-fat versions of many of the ingredients to lighten it up some and it was still incredibly rich and didn't taste low-fat in the least bit! This was for our Wednesday night community group, but I made it on Sunday and kept it in the freezer covered in foil. I had no problems cutting it into slices and it was a hit among our group! I will definitely be making this again, and think it would be excellent if chopped up Reese's peanut butter cups were added to the filling. 1. Grease a 9-inch springform pan and set aside. 2. Melt the butter and chocolate chips in the microwave, stir to remove lumps. 3. Add the cereal and mix carefully until the cereal is coated in the chocolate. 4. Press the cereal into the bottom of the springform pan and place in the freezer while making the filling. 5. Using a mixer, mix the milk, cream cheese, peanut butter, and powdered sugar until combined. Mix in the cool whip. 6. Pour the filling into the springform pan. If desired, top with candies or chocolate syrup (I topped with crushed peanut butter m&ms). The great thing about this dish is that it can be prepared ahead of time. I actually made the lasagna on Sunday afternoon when I had some free time and kept it covered in the fridge until tonight when we ate it. I was thrilled to come home tonight, knowing all I had to do was stick it in the oven and thankfully, it still tasted incredibly fresh! It was a little runny, and I'm not sure what caused that, but it didn't affect that taste at all. This wasn't my favorite way to eat eggplant, but overall I liked it. See below for most of the process in pictures! 1. Heat broiler. In a food processor, puree the tomatoes, garlic, 1 tablespoon of olive oil, and 1/4 teaspoon each salt and pepper. 2. In 2 batches, arrange the eggplant on a broilerproof baking sheet, brush with 2 tablespoons of the oil, and season with 1/2 teaspoon salt and 1/4 teaspoon of pepper (I didn't measure this, just sprinkled away) Broil until charred and tender, 3-4 minutes per side. 3. Meanwhile, in a small bowl, combine the ricotta, egg, basil, and 1/4 teaspoon each salt and pepper. 4. Spread half the tomato sauce in the bottom of an 8-inch square baking dish. On top of it, layer a third of the eggplant and half the ricotta mixture. Add a layer of spinach. Repeat with another layer of eggplant and ricotta. Add another layer of spinach. Top with the remaining eggplant and tomato sauce. Sprinkle with the cheese. Real Simple tells you to serve this lasagna with mixed greens, drizzled with olive oil, salt, and pepper. Instead, I added greens to the dish itself. I loved the addition of spinach to the lasagna, but I'm sure it would be good either way!